If you’re familiar with Dewey’s Bakery, you know our treats have been part of holiday traditions & celebrations in our hometown of Winston-Salem, NC for more than 80 years. When the temperatures drop and the lights line the streets, it’s time for some warm baked goods with beloved holiday flavors. And nothing says Christmas in our neck of the woods quite like our Moravian Cookies! 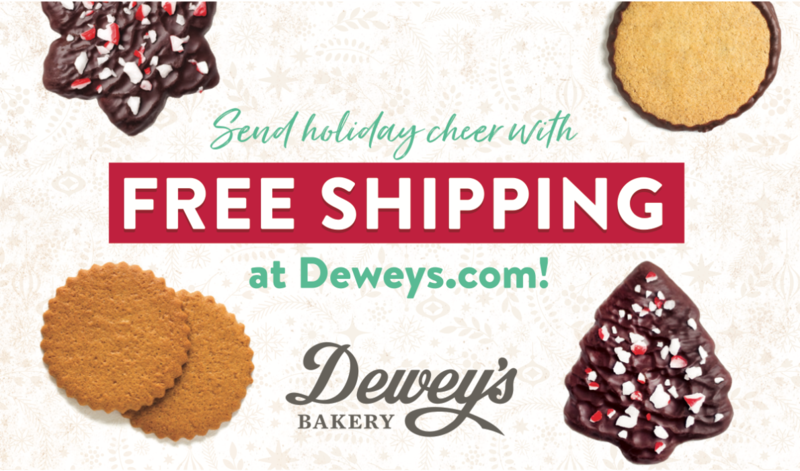 This year, we’re making it easier than ever to share the unforgettable taste & joy of Dewey’s Bakery Moravian Cookies with your family and friends by offering free shipping on all orders of $24.99 or more. That means more goodies for less money! Whether Dewey’s Bakery is part of your holiday traditions or if you’re new to us, welcome. We are your hometown bakery, no matter where you are! Our Classic Sugar Moravian cookies are baked in small batches in Winston-Salem, North Carolina using a centuries-old recipe. Our bakers mix full vanilla flavor with finely milled wheat flour and whole eggs to create thin and flavorful cookies! You can purchase a Moravian Cookie gift tin with cookies in the classic style or in special holiday shapes. Our Moravian Cookie gift tins are filled to the brim with delicious cookies and double as decorations with their festive designs! Shop Classic Sugar Moravian Cookies now. Our Ginger Spice Moravian cookies are the original Moravian cookie! We’ve been baking these signature cookies since 1930, and our bakers stay true to the centuries-old recipe. By combining rich molasses and brown sugar with exotic spices like clove, ginger, cinnamon, and allspice, our bakers capture the taste of Christmas in an unforgettable Moravian cookie! Shop Ginger Spice Moravian Cookies now. Our Salem Baking Company Chocolate Enrobed Peppermint Moravian Cookies feature our classic Moravian Sugar Cookies in five fun holiday shapes! The Moravian Sugar Cookies are baked with premium ingredients in small batches at our bakery in Winston-Salem, NC. Then, our bakers gently enrobe them in artisan chocolate and top them with a crunchy sprinkle of crushed peppermint. These Moravian cookies come in a cute box and make for a perfect stocking stuffer! Shop Chocolate Enrobed Peppermint Moravian Cookies now. It’s never too early to prepare for the holidays, and with free shipping on all orders $24.99 and up, it’s easy to send a little taste of Winston-Salem anywhere! Would you like to win a year’s supply of our delicious cookies and crackers? Click here to enter our 12 days of Christmas giveaway!